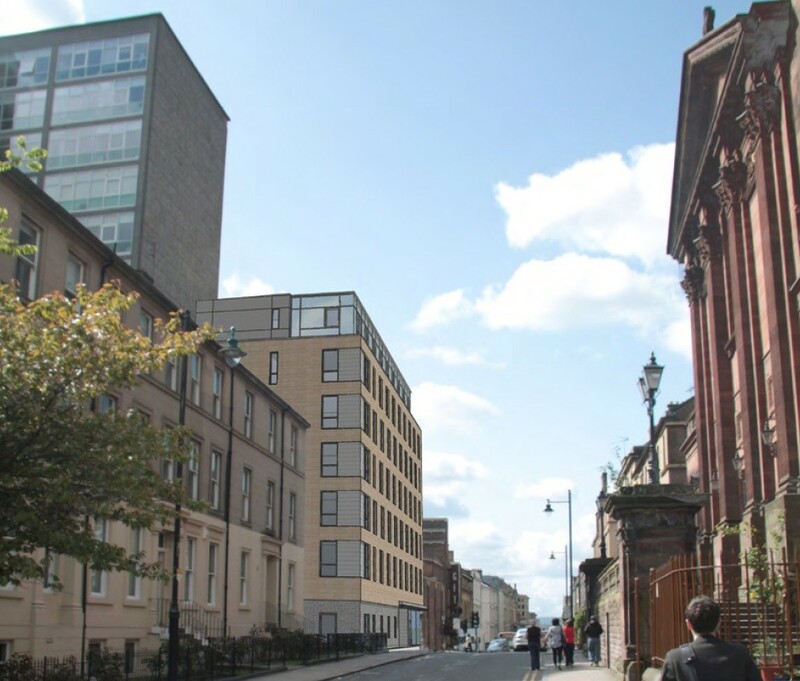 Lewis & Hickey have submitted revised plans for their student accommodation development on Renfrew Street on behalf of Inehaze – owners of the Fleming House apartment block – after previous schemes were rejected on the grounds of height and materials. 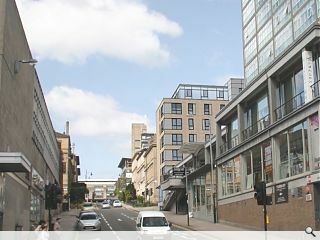 This has seen the number of floors reduced and blonde sandstone cladding adopted to tie-in with the surrounding streetscape. Florentine polished blockwork will be used at lower level to continue the plinth of Fleming House and contrast with the sandstone. 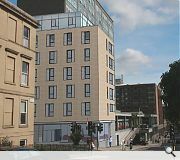 The completed scheme will deliver 85 beds of accommodation for Glasgow School of Art students above an existing underground car park and waste ground at the corner of Rose Street, reinforcing the building line. Having seen the first two attempts to build accommodation on this site this still does not look any better, the scale is far too large! 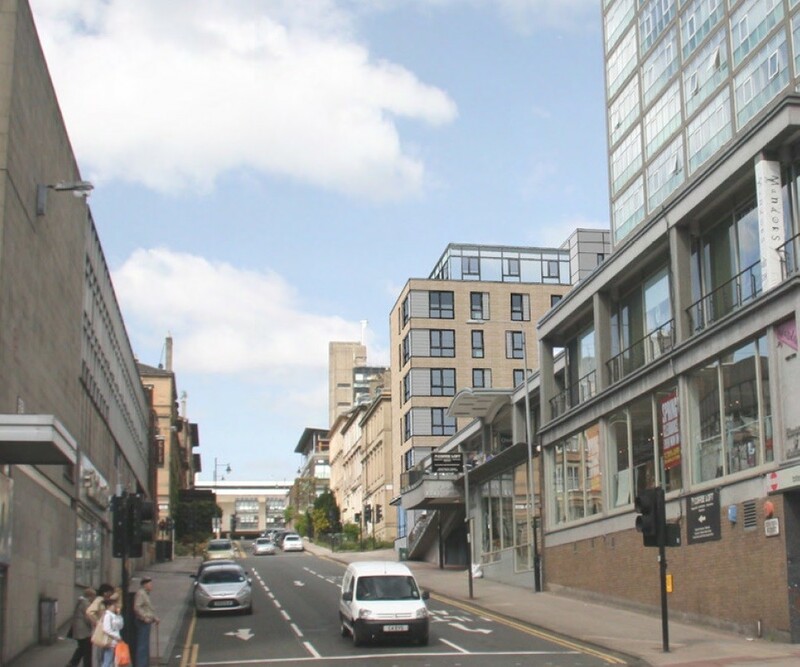 I can't agree that this scheme is 'far too large'- for one it's in the city centre; secondly it's surrounding by fairly tall buildings- particularly looking toward Townhead, where there's the Thistle Hotel, Cineworld, and directly next to it is the towering bulk of Fleming House itself; thirdly the mock sandstone line is more or less in scale with the older tenements across the road. 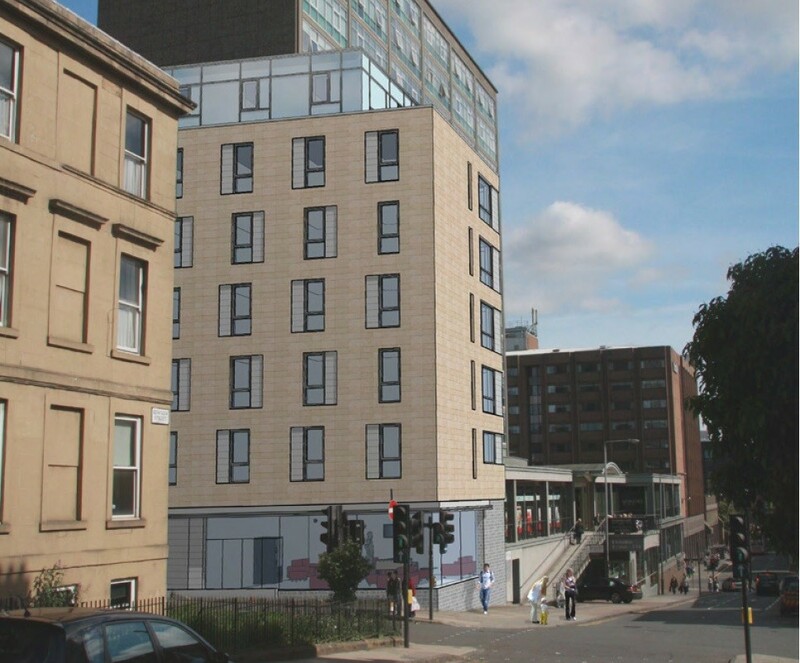 I can see a case for objecting to the scheme via poor design & materials but not scale. There is no pleasing the people here. You spend your whole time moaning that thinks arent tall enough and when something comes along you then moan that its too large ! Agree with Wonky - scale and massing are about right here; it's the lacklustre elevational treatment and dearth of any depth or modelling that are more cause for concern. I think the scale is pretty much spot on. 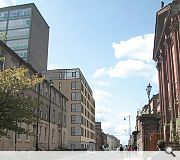 A good interface between the Garnethill tenements and the edge of the inner city grain. Pretty disappointed with the design though. Looks very cheap and bland. Compare with the Unite student flats proposed in Edinburgh on one of the other UR articles below this one, which show depth, quality of material, and subtle control of form. These appear to be just wallpaper thin with a token 'let's use another material to emphasise the corner at the windows'...except lets use a material that's inferior to the rest of the building. And why is the 1st floor corner window smaller than the rest? It looks at odds with the rest. Ground floor is even worse. No depth, what looks worrying like blockwork, and no sense of entrance or connection with the street. We need BRILLIANT buildings in the city centre. Not mundane, nothingness like this. This looks the same to me as the current consent? Not sure what has changed?